When it comes to computers, smartphones or just anything electronics in general it’s always a good idea to have a backup. The Apple iTunes ecosystems allows a user to easily create a backup from your phone that includes your data, settings, literally everything with just a touch of a button. So even if you lose or break your device you can simply buy a new one and restore your backup. It’s as if it never happened. However things on Android have never been that easy. Users with a rooted device could always use Titanium Backup to backup all applications and settings but I haven’t heard of an application that allows this on non-rooted devices. I reckon that technically it’s not possible without root access as applications don’t have the permissions to access the /system/app/ folder where all the installed applications reside. Luckily, there seems to be a way now to backup your Android phone with the help of ADB – the android debug bridge from the android SDK. Keep in mind that your phone needs to have at least Android 4.0 running. As this hasn’t been publicised explicitly as a new feature of ICS I would still treat is experimental. From my personal experience I can tell that it works rather well, otherwise I wouldn’t be writing about it. Before we start, I am going to assume that you’ve already installed the Android SDK and updated the SDK Platform Tools to the latest version using the SDK Manager. specifies where the backup file will be saved. flag sets whether or not the APK’s of an application should be included in the backup or simply the application’s respective data. The default is -noapk. I highly recommend -apk just in case the apk is not available anymore from the market. Saves hunting down the apk on some dubious 3rd party file hoster. flag sets whether the device’s shared storage (included memory of the device), usually mounted at /sdcard/ is backed up. The default is -noshared. I highly recommend this for nexus devices as they have no external micro-sd card slot and all the pictures/music are saved on the internal storage. Still use a PC to backup your pictures/music manually or use something like Dropbox or G+ Auto-Upload. Better safe than sorry. flag sets whether or not the -all flag will also include system applications or not. When I backup my phone I always use -system just in case. I guess when restoring your backup to a new phone with a higher Android version it would be advisable / safer to use -nosystem. You can enter a password to encrypt the backup. You will need this password to restore the backup. Thus make sure not to forget or don’t set one. 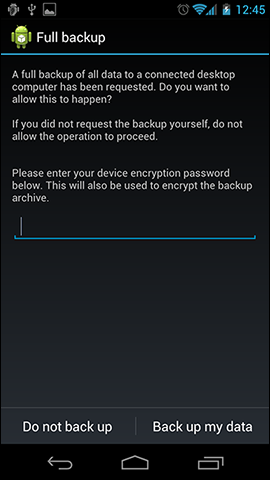 replacing ~/backups/nexus4_20130901.db with the location of your backup file. 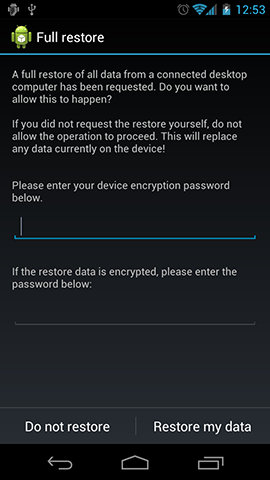 Type in your current encryption password in case you set one and press ‘Restore my data’ to begin the restore. Again it can take several minutes up to a couple of hours. After the restore your should system should be back just like when you created the backup short of some widgets and wallpaper on the homescreen. My alarms remained and for most applications it even kept my login. It kept everything.